Hopefully you’ve found a bunch of helpful Citi Field tips on this website; I know deciding on a burger can be a difficult thing at a ballpark. Here are a few things you’ll want to photograph at New York’s home of National League baseball. Anyone know where I can get a muffler after the game? Citi Field Photo-Ops, #1: The View From The Coca-Cola Corner. When Matt Silverman, the author of “100 Things Mets Fans Should Know Or Do Before They Die” asked me what my favorite part of Citi Field was, the first thing that popped into my head was the view from the Pepsi Porch, which is now the Coca-Cola Corner. What’s striking, to this writer anyway, is that view of chop shops. Muffler mavens. 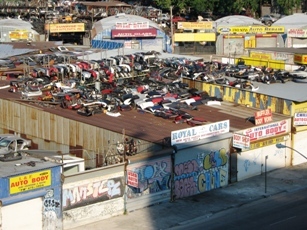 Junkyards. As far as the eye can see. It’s jolting, because you’ve spent all of this time walking around this magnificently designed ballpark. You’ve been bowled over by the Jackie Robinson Rotunda and the Mets Hall of Fame and the Shea Bridge. You’re looking at padded seats and the Audi Club and the sushi bar and you see that well-to-do people are coming here for a ballgame. You see the price tag of Citi Field and what Citibank paid for the naming rights, numbers that to most of us are too staggering to contemplate. And then you look out from the Coca-Cola Corner and there is no doubt. You’re in Queens. The Ultimate Answer to Life, The Universe, and Everything. 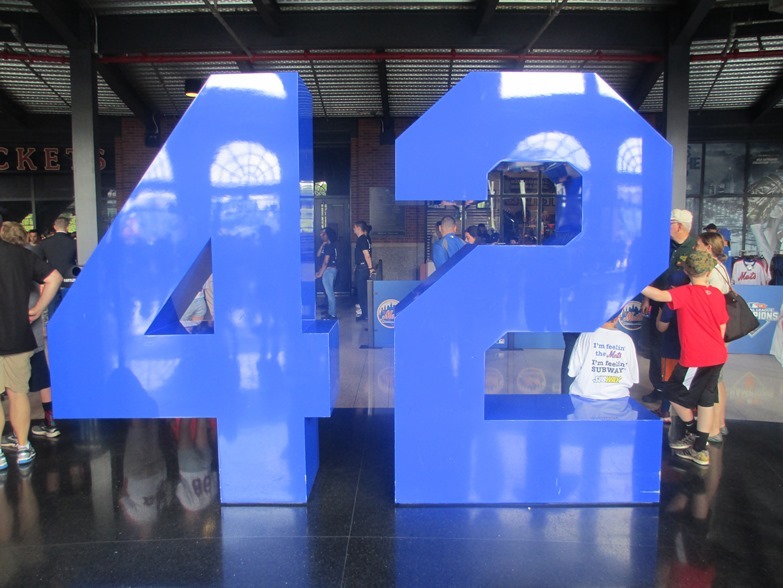 Citi Field Photo-Ops, #2: The Jackie Robinson Rotunda. After the game. If you’re approaching Citi Field from the 7 train station, you’ll be tempted to use the home plate entrance that opens into the Jackie Robinson Rotunda. When Citi Field first opened, some Mets fans griped—perhaps justifiably—that the new home of the Mets almost seemed like a shrine to the old Brooklyn Dodgers, and this was personified by the dedication to Robinson, who never played an inning for the Mets. But in fairness, Robinson did play in New York, and his impact was large enough for at least one major league ballpark in the city to acknowledge it. Had Montreal or Kansas City dedicated a piece of their ballpark to commemorate Robinson’s time there, it wouldn’t have been a problem. Anyway the Rotunda is beautifully designed, filled with photos of a great American hero, sections listing his nine values and historic events in his career. It’s worth taking some time to look around in…just one piece of advice—do it after the game, when crowds are much smaller. The other part of the Miracle Staff. 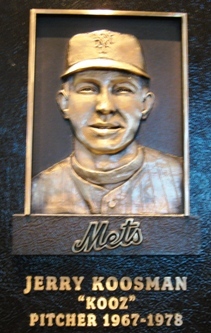 Citi Field Photo-Ops, #3: The Mets Hall of Fame. The Mets Hall of Fame with its entrance from the Rotunda is part of the Mets response to fans annoyed that their fine new ballpark barely acknowledged itself as the home of the Mets. It’s filled with plaques of Mets greats, the team’s two World Series trophies, and other dedications to the Amazin’s—and say what you will about the Mets, you can’t deny that their history makes for great baseball lore. Of course, the Mets arranged the Hall of Fame to exit right into the souvenir store—but we can forgive them for this, since they took the trophies out of the Champions Suite for the rest of their fans to see. And as souvenir stores go, this one isn’t shabby at all. Want to know more about Citi Field? 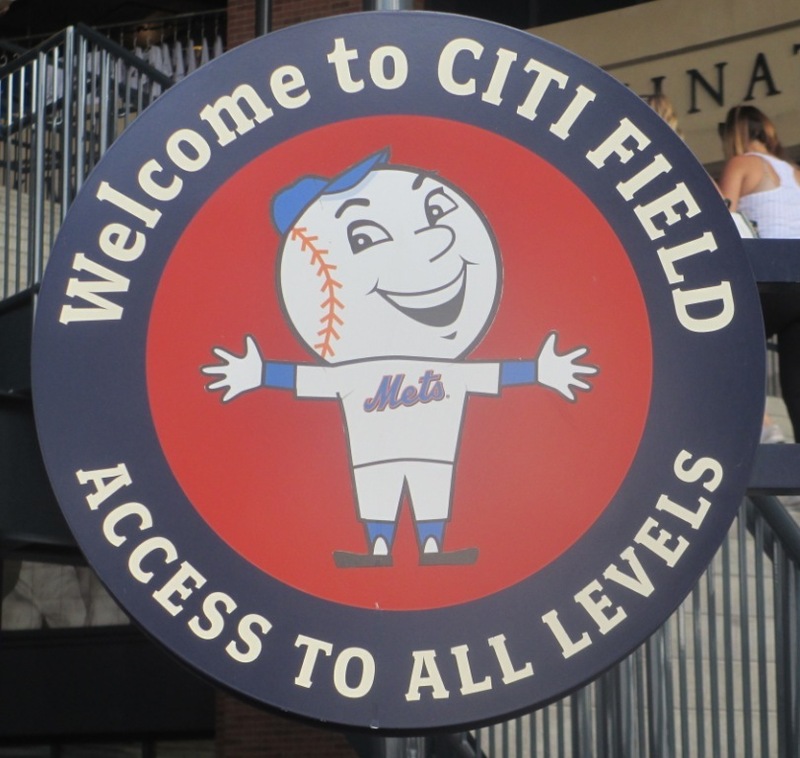 Sign up here for my completely free Citi Field e-mail newsletter series, and score some seriously valuable info about tickets, seating, transportation and food…see you at the Yard! Enjoying the cool Mets game tips? Sign up today for the absolutely free Ballpark E-Guides Citi Field newsletter!